Adjuvant Secure Ultra makes an effective, easy-to-use technique for deposition improvement which enables drift retardation in the spraying operations. The adjuvant Secure Ultra, is designed for general use which has standard ground and aerial applications and makes a fully compatible mixture with a wide variety of spray configurations including those with new A.I, and other specialized drift reduction nozzles. More to say about adjuvant Secure Ultra is compatible in tank mix applications which have a broad spectrum of crop protection pesticides, which includes the complete range of all branded and generic glyphosate formulations. 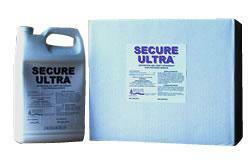 Would you like to see the Secure Ultra Label? How about the Secure Ultra MSDS sheet?